No endgame in chess history seems to be paid so much attention to by chess elite as to that arisen in the famous duel between great Mikhail Botvinnik and legendary Robert Fischer at the 15th World Olympiad. By the way, the 7th October was the 45th anniversary of the memorable game. Everybody who is interested in chess history must probably well remember that the significance of the outcome of the struggle between the leaders of the USSR and the USA teams (world champion and in fact one of the main claimants for the title) was far beyond a usual sport result. The first half of the remarkable fight was very instructive and fascinating though the opponents, as it was revealed later, could not avoid some mutual inaccuracies due to quite understandable high tension. Still before the control 40th move American grandmaster managed to gain tremendous advantage. His technique of realization being very high, numerous spectators had little doubt that the outcome is in fact decided in Black's favour. But then something unforeseen happened. Nerves turned out to interfere crucially, and the game began to follow the most dramatic scenario. Here Fischer, unexpectedly for everybody, hastily played 41...¤e4+?! Botvinnik points out that Black would attain his object by 41...¦b4! 42.a3 ¦d4 43.f3 a5 44.Ґb1 ¦d1. I shall add to this, that, to my mind, White could hardly save the rook endgame after 42...¤е4+ 43.Ґxe4 (quite hopeless is 43.ўf3 ¤xc3 44.ab ўh4 or 44...a5) 43...¦xe4 44.¦с7 ¦а4 45.¦xh7 ¦xa3+ 46.f3 a5. 42.Ґxe4 ¦xe4 43.¦а3? An obvious return mistake. 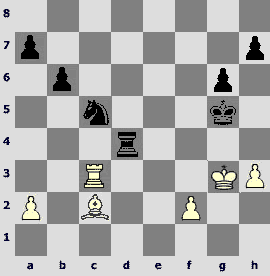 White must use his chance – 43.¦с7! with a draw as the most probable outcome. 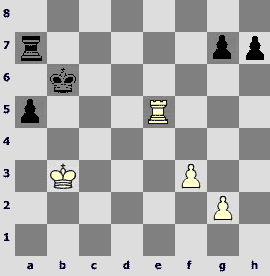 Both opponents also thought so, believing that White escapes by means of a counterattack similar to that occurred in the further course of the game itself. But later (see G.Kasparov, 'My Great Predecessors' vol. 2) the thirteenth world champion expressed his opinion that Black could win by 43...¦а4 44.¦xh7 ¦а3+! (depriving the white king of the comfortable shelter on f3) 45.f3 ¦xa2 46.h4+ ўf5 47.¦f7+ ўe5 (note that promises nothing 47...ўе6 46.¦g7 ўf6 49.¦b7, and it is not easy to put black passed pawns into motion. Using a standard method: 49...¦а5, 50...b5, 51...a6, 52...¦а4 requires a lot of chess time – more than ten tempos, and White would surely use it to create a counter-play on the kingside. To think of it, just this fact is the real foundation for the 'fantastic', as Mikhail Tal said, 'idea by Geller to struggle with two separated pawns against two tied ones' employed in the course of finishing the game). First, the variation obviously needs further explanation since it would be good to understand the outcome of pawns' races starting after 48.¦g7 ¦a1 49.ўg2 b5 (an informal chess rule reads: one should advance his pawn chain in such a way that a pawn closest to the board corner be a leading one. The observation can be explained easily as the arrangement ¦b4 + pawns а5, b6 is more perspective than ¦а4 + pawns а6, b5 due to greater activity of the rook. But the principle in inapplicable here because of concrete considerations: 49...a5 50.¦xg6 ¦b2 51.h5). 50.¦xg6 b4 51.h5 b3 52. h6 b2 53. h7 ¦g1+! 54.ўh2 ¦h1+ 55.ў xh1 b1Ј+ 56.ўh2 Јс2+ 57.ўh1 (57.ўh3 Јf5+ 58.ўh4 Јxg6 59.h8Ј+ Јf6+ 60.Јxf6+ ўxf6, and Black's pawn promotes freely). Now Black has several winning continuations: 57...Јс8 or 57...Јd1+ 58. ўh2 (58. ўg2 Јe2+ 59.ўg3 Је1+ 60.ўg2 Јh4 61.¦g7 a5, and White could only hope to prolong his resistance by trading his passed h-pawn for Black's a-pawn thus transforming the game to a technically lost endgame) 58... Јd2+ 59.ўh1 Јd8 60.¦g5+ (60.¦h6? Јd1+ 61.ўg2 Јd2+) 60...ўf6 61.¦h5 ўg7, and Black also wins easily in the pawn ending. All this still confirms Kasparov's point of view. Second, White has other ways of counter-play, not studied in detail yet, which is not surprising for such a complicated ending. Thus, a try to activate extremely both kingside pawns 48.f4+ deserves attention. Now the stronger side must choose which central square of three to prefer for retreating of his king. I shall note, without going into details, that only 48...ўе4! seems to lead to the decisive advantage for Black, as other continuations 48...ўd4 and 48...ўd5 give White an opportunity to escape by a typical breakthrough 49.f5!? gf 50.h5. Black must be even more troubled by another resource offered by Efim Geller (I have to forestall a little) during home analysis as a main receipt in a similar position. The point is that after 48.¦g7¦а1 49.ўg2 b5 White would defend by 50.h5!? Now natural 50...gh 51.¦g5+ ўf4 52.¦xb5 ¦а2+ 53.ўh3! ўxf3 54.¦xh5 leads to a drawn position. A move transposition 49...ўf4 50.¦ xg6 ¦a2+ 51.ўh3 ўxf3 52.¦f6+ ўe4 53.h5 changes little in the estimation. At one moment I even believed that everything is opposite and Black must search for a win after the immediate capture: 44...¦xa2 45.h4+ ўf5 46.¦f7+ (suspicious is 46.¦b7 ўе4! 47.ўg4 ¦xf2 48.¦xa7 ¦g2+49.ўh3 ¦с2 50.¦g7 ¦с6 51.ўg4 ўd5! 52.ўg5 b5 53.¦xg6 ¦xg6+ 54. ўxg6 b4 55.h5 b3 56.h6 b2 57.h7 b1Ј+, and Black wins following known examples) 46...ўе4 (as readers will see later, the square was prohibited for the king in the game itself because of losing the a4 rook after ¦f4+). However, 47.¦f6! (not 47¦g7 ¦а1 48.ўg2 ўf5!) puts everything into place – White has sufficient counter-play. But let us proceed to the game at last. 43...¦е7?! Continuing the same unjustified hasty line of struggling. As Botvinnik points out, 43...а5! led to a win. The only thing black could beware of was a transition into a pawn ending, but in fact it would be an inevitable crash for White: 44.¦b3 ¦b4 45.¦xb4 ab 46.f4+ ўf5 47.ўf3 ўe6 48.ўe4 (48.ўg4 h6!) 48...ўd6 49.ўd4 b5 50.ўd3 ўd5 and so on. 44.¦f3 ¦с7. And here, in both opponents' opinion (it will be clear later why I willingly join this recommendation), a timely manoeuvre 44...ўh6 and then 45...ўg7 would give Black winning chances. 45.а4! An excellent defence resource! Here the game was stopped and Fischer sealed his secret move. Six (!) world champions were involved, to some or other degree, in further investigating of the famous position (Botvinnik, Fischer, Spassky, Tal, Euwe and Kasparov). Besides, such high-class specialists as P.Keres, I.Boleslavsky, S.Furman and E.Geller helped to clarify the estimation of the position. As Botvinnik witnessed, the latter of the grandmasters quartet played almost a leading role in putting into shape of the idea content of the whole analysis. Moreover, Mikhail Botvinnik later asked international master Anatoly Kremenietsky (then his colleague in a scientific institute) to write a summing up article on this ending ('Chess in the USSR' #2/1977). But, in spite of the numerous and very authoritative 'jury', a question of the final estimate of the diagram position is still open. 46.¦f7 ¦а5 47.¦:h7! ¦:a4 48.h4+! ўf5! 49.¦f7+ ўe5 50.¦g7 ¦а1! 51.ўf3! Here Black played 51...b5?, which allowed White to save the game easily by 52.h5! ¦а3+ 53.ўg2 gh 54.¦g5+ ўd6 55.¦xb5, as a theoretic drawn ending arises. If Black would choose 51...ўd5!? 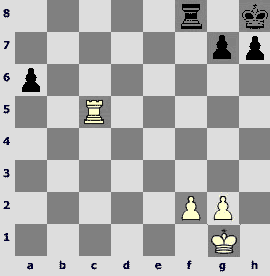 then White would escape by 52.¦xg6 b5 53.ўe3 (also possible is 53.ўе2 ўс4 54.h5 b4 55.¦g4+ ўb5 56.ўd3) 53...a5 54.ўd3 ¦а3+ 55.ўс2 ¦а2+ 56.ўс3 ¦xf2 57.¦g5+ ўc6 58.¦g6+ ўd7 59.¦g7 ўe6 60.¦а7. According to Euwe, the strongest reply is 51...ўd4! White must show maximum caution: 52.¦xg6 b5 53.h5 b4 54.h6! b3 55.¦g4+! ўc5! 56.¦g5+ ўc6! 57.¦g6+ ўb7 58.¦g7+ ўa6! 59.¦g6+ ўa5! 60.¦g5+. Here after 60...ўа4 Botvinnik's interesting analyses proving equality extend for more than a dozen moves. But for general estimate Kasparov's indication that computer variations 60.h7!? ¦h1 61.¦g7 ўb6 62.ўg2 ¦h5 63.¦g3 or 61...а6 62.¦b7 ўa4 63.ўg2 ¦h5 64.f3 ўa3 65.¦а7 also lead to equality seems to be enough. Now, what if another move would have been sealed? At the Olympiad the efforts of the whole high-skilled analytic team were concentrated for some reason (to my mind, this is the biggest mystery) mostly on the move 45...¦с5. We know it justified itself in the end, but we cannot ignore the fact that Black's position has several indisputable merits as compared to that of White. First, it is Black's turn to move now. Second, his pawn structure is significantly better: two chains, though short, against three isolated pawns. Third and most substantial, his material advantage is not sufficiently compensated for White, a bad location of the black king on g5 being a partial compensation. Why, is the sum of all these factors really not enough to obtain real winning chances? After all, we know from practice that advantage, as energy of chess space, never disappears without trace. This very circumstance has been bothering me for a long time, making me to return to the ending again and again. In my opinion, unbiased analysis would certainly reveal other deserving attention continuations in the position. For instance, the following ones: 45...а6, 45...а5, 45...h6, 45...¦с4, which were not fully reflected in the joint analysis. Let us consider some of them. 45...а6 46.h4+ ўh5 47.¦d3 ¦c4 48.¦d5+ ўh6 49.¦d6 ¦a4 50.¦b6 ўh5 51.¦b7! 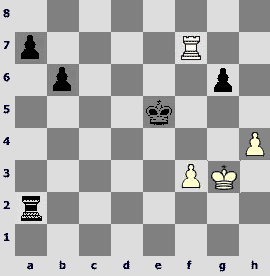 h6 52.¦b6 ¦g4 53.ўf3 ўh4 54.¦a6 ¦g1 55.ўе2 ўh3 56.f4, and in spite of all Black's efforts it must be a draw. 45...а5 46.h4+ ўh5 47.¦b3 ¦с4 48.¦b5+ ўh6 49.¦xb6 ¦xa4 50.¦b5 ¦a2 51.ўf3 a4 52.¦a5. White should stand his ground. 45...¦с4 46.а5 ba 47.¦f7 a6 48.¦d7. We shall often have an opportunity later on to make certain that White's chances for a draw are very high in similar positions. Also, 45...¦b7 would deserve serious attention so that on 46.а5 b5 47.h4+ ўh6 48.¦f6 to reply 48...b4. However, 49.a6 ¦b5 50.¦d7 b3 51.¦b7 ¦b6 52.¦xb6 ab 53.a7 b2 54.a8Ј b1Ј 55.Јf8+ ўh5 56.Јf3+ only leads to perpetual check. We must admit now that all these new attempts to play for win also failed as well as 45...¦с5. To understand why, let us clear up what, properly speaking, would we want to achieve by changing the position? In fact, we were trying constantly to build a construction where our pawn piers on both flanks would be defended by the rook. 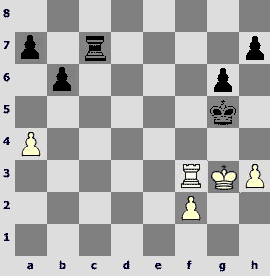 Chess professionals in everyday language use to call similar arrangement in the rook endgame 'a system'. In most cases it loosens hands free and the stronger side's king gets an opportunity of free manoeuvring. But let us stare at the adjourned position more attentively from this point of view. Now our eyes are open as if anew, and we discover, to our surprise, that such a 'system' has been built already and is standing on the diagram above! Well then, everything we have been doing so far – ¦с5, ¦с4, а6, а5, h6 (except for ¦b7 – here we have been simply wasting time) cannot be called other than voluntary self-destruction of the 'system'! That is why all our previous attempts to win were in vain. Instead of strengthening the 'system' we have been dismounting it. Now, the 'system' being built already, then the question is how to develop and improve it later on? The existing construction itself cannot ensure winning, as its character is static. We could make sure of it many times in our analysis, when in spite of an extra passed pawn Black's strategy deadlocked, lacking a plan for strengthening his position. Consequently, we should transform a static 'system' into a dynamic one, which would prepare and support future advancing of the passed pawn. Obviously, to realize these qualitative changes, interaction and support of all available battle units is required, and first of all, of the main personage in any endgame, the black king in our case, who so far has been watching indifferently the events on the board from the distance. So, the logical conclusion is that the only correct solution of the problem would be an unhurried raid 45...ўh6! (I emphasized earlier that building of a system gives free hand to the main piece first of all) aiming at returning the king to the central squares. The fruitful idea of transferring the king to the opposite flank just via the seventh rank was certainly well familiar to Mikhail Moiseevich, as seven years before he had the occasion already to get out of scrape in a similar situation. 45...ўg5?! We see as before that the king occupies a pseudo-active and not very good location restricting mobility of own pawns. Besides the opponents, most of analysts (G.Levenfish, V.Smyslov, N.Kopaev, S.Furman) believed that, as in previous examples, immediate march of the king to the queenside along the seventh rank led to a win. 46.f3! ўf5. One of the best modern experts on endgame Mark Dvoretsky, who wrote a remarkable section on rook endings in his Course, points out that '46...f5!? 47.ўf2 ўf6 48.h4 ўе5 49.ўе3 ўd5 was possible but then after 50.g4!? the outcome remains unclear'. I think much will depend here on the estimation of forced events in the variation 50...fg 51.fg ўс5 (if 51...hg then 52.¦xg4 ¦а6 53.ўd3) 52.ўd3 ўb5 53.¦e4 ¦с7(53...а4 54.gh gh 55.¦е5+ ўb4 56.ўc2) 54.¦e6 ¦с6 55.¦е5+ ¦с5 56.¦е6 g5!? 57.hg hg 58.g6 ¦g5 59.ўе2 а4 60.ўf2 a3 61.¦е3. 47.g4+ hg? Only this continuation finally deprives Black of winning chances. 'As posterior analysis showed, by playing 47...ўе6! Black would still retain winning chances' (Dvoretsky). It seems so, indeed, as after 47...ўе6 48.gh gh 49.ўf2 ўd6 50.ўe3 Black, apart from 50...ўc6, has the manoeuvre 50...¦е7+ 51.ўd3 ¦е5. White also has some troubles in holding his position after 47...ўg5 – 48.ўg2 (S.Furman and G.Borisenko, the two prominent chess investigators and friends, in their joint comments believed justly that 48.gh ўxh5 49.h4 also led to a draw, meaning probably that after 49...f5 50.ўg2 f4 White would not play for an unrealizable stalemate 51.ўh3 ¦a8 52.¦a1? a4 53.¦a2 a3 54.¦a1 g5! 55.hg a2, but by means of 51.ўf2 ўxh4 52.¦xf4+ he would hold the position by accurate manoeuvring) 48... ўh4 49.h3 ¦а8 50.ўh2 ўg5 51.ўg2!? (51.ўg3?! h4+ 52.ўf2 f5 is less definite) f5 52.h4+!ўf6 53.gh gh (53...g5 54.h6=) 54.ўf2 ўe5 55.ўe3, but one must admit that after 55...f4+ 56.ўd3 (capturing the pawn is clearly disadvantageous in view of 55...а4) or 55...ўd6 56.ўf4 White stands firmly. 48.fg+ ўe5. According to Botvinnik, also leads to a draw 48...ўg5 49.ўg2 ўh4 50.h3!? g5 (if 50...¦b7, then certainly 51.g5+) 51.ўh2 ¦b7 52.¦xa5 ¦b2+ 53.ўg1 ўxh3 54.¦а6 ўxg4 55.¦xf6 ўg3 56.¦f1. 49.h4! ўd5. A bit more cunning is 49...ўd6 50.h5 ўе751.hg ўf8, but after 52.g5 fg 53.¦g4 а4 54.¦xg5 а3 55.¦f5+ ўg7 56.¦f1 the sides part in peace also. 50.h5! gh 51.gh ўe6. White easily avoids traps like 51...¦а8 52.ўg2 ўd5 53.h5 gh 54.gh ўc5 55.h6 ўb5, as besides standard 56.¦h4 ¦g8+!? 57.ўf1! a4 58.¦h5+ ўb4 59.¦h4+ ўb3 60.¦h3+ ўb2 61.¦h2+ ўb1 62.¦h3 he also can draw simply by 56.¦f4. 52.h6. And, having generated a remote passed pawn, White achieved a draw. 'The most cunning was 45...ўh6, but here after 46.¦d3 ¦с5?! (my sign – why one should destroy the 'system'? – I.Z.) 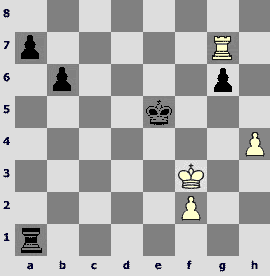 47.h4 ¦а5 48.¦d4 Black also would achieve nothing'. Probably Botvinnik means that in case of 48...ўg7 49.¦d7+ ўg8 50.¦d8+ ўf7 51.¦d7+ ўе6 52.¦xh7 ¦xа4 the line in fact comes to the course of the game after 45...¦с5 where White managed to escape. Instead, as I mentioned already, the black king must join the main forces as soon as possible – 46...ўg7. How White can oppose to this unhurried plan? If 47.а5 then 47...ўf7! (47...bа is not worthy as instead of 48.¦d5 а6 49.¦xa5 ¦a7 allowing Black to get a modest dynamic system, White may play stronger – 48.¦d6! transferring the rook to a6 and making the opponent's task much more difficult). 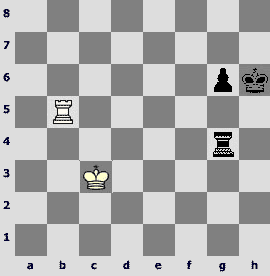 Now White is unable to prevent the black king from further moving to his goal. It is bad to admit appearance of a new dynamic system: 48.ab (48.¦d6 ўe7 49.ab? ¦c3+) 48...ab 49.¦b3 ¦b7 50.¦b5 ўe6 with obvious Black's superiority. On 48.¦d8 not only 48...¦b7!? is good, but also 49...ўе7 50.¦b8 ba 51.¦b5 a6 52.¦xa5 ¦c6 or 52...¦а7. Wonderful computer Rybka posts a shaky defensive barrier: 46.¦f4 ўg7 47.f3 and then 47...¦e7 48.h4 ¦d7 49.ўg4 ¦d5 50.ўg3 ¦a5 51.ўg4 ¦с5 52.ўg3. A question arises automatically: why not, instead of this unintelligible electronic recommendation, try 47...а6!? 48.¦d4 ¦b7 49.¦d6 ўf7 50.a5 ўe7 51.¦c6 ўd7 52.¦f6 b5 53.¦xa6 b4 54.¦f6 (54.¦а8 ўс7 55.а6 ¦b8) 54...ўс7!, and White is in a critical situation. It remains only to check 46.а5 ўg7 (if 46...ba then 47.¦f6) 47.ab (47.¦b3 ¦b7 does not change matter) 47...ab 48.¦b3 ¦b7 49.¦b5 ўf6 with good chances for success. In principle, the main white's mechanism is based on moving a4-a5 and getting rid of this weak pawn. Then, having blocked safely the opponent's passed pawn arisen on the queenside, White proceeds to the second stage and undermines by h3-h4-h5. As a rule, the stronger side has to reply g6xh5 (else an object convenient for counter-attacking arises on g6, and sometimes White even operates with a positional threat h5-h6); as the result White obtains his own passed f-pawn. At this moment everything depends on the black king's activity – the question is whether White would succeed, by means of distracting, in trading the f-pawn for the a-pawn. So, one should not be deluded by slowness of transferring the king to the other side of the board, that this plan might be conducted somewhat later. No, every tempo costs much! Thus, in case of rejected earlier 45...¦с4 46.а5 an illusion appears that everything might be recovered by playing 46...¦с7!? But White is on the alert: 47.¦f8! (with the idea 48.аb ab 49.¦b8) 47...¦b7 (if 47...ba then 48.h4+ ўh6 49.¦f6, and in case of 48...ўh5 – 49.¦d8) 48.a6 ¦c7 49.f3 (it is necessary to prevent the threat ¦с7–с3+ –а3) 49...ўh6 50.¦g8! ¦d7 (in case of 50...g5 White's defence becomes easier – 51.¦b8 ўg6 52.¦b7 ¦f7 53.h4 gh+ 54.ўxh4 h5 55.ўg3 ўf6 56.f4) 51.h4 ¦c7 (forcing the opponent's rook to leave the g8 square since 52.ўh3 loses after 52...¦с3) 52.¦b8 ўg7 53.¦b7 ¦f7 54.h5! (54.ўg4 is more logical at first glance – now 54...h5+ is disadvantageous for Black in view of 55.ўg5 b5 56.f4 b4 57.f5 gf 58.¦xb4, but in case of 54...ўf6 55.h5 gh+ 56.ўxh5 ўe6 57.f4 ¦xf4 58.¦xa7 ¦а4 59.¦а8 ўd6 60.a7 ўc6 Black turns out to win; 57.ўg4 is also insufficient due to 57...h6 or even 57...h5+ 58.ўxh5 ¦xf3 59.¦xa7 ¦a3 60.ўg4 ўd6 61.ўf4 ўc6 62.ўe4 ўb5 63.ўd4¦xa6, and according to Nalimov's tablebase Black wins again) 54...gh 55.f4 ўg6 (55...ўf6 56.f5) 56.f5+ ¦xf5 57.¦xa7¦a5 58.¦a8. Here, exchanging queenside pawns in time, White makes a draw. The same motives are heard in case of 45...ўh6 46.¦d3 ¦с4 47.а5 ¦c7 48.¦d8 ¦b7 49.a6 ¦c7 50.¦g8. An interesting try is 46.¦f8 ¦b7!? (It seems the most perspective continuation to me. Less definite is 46...ўg7 47.¦b8 ўf7 48.a5 ba 49.¦b5 a6 50.¦xa5, and both 50...¦c6 51.h4 ўe6 52.h5 and 50...¦а7 51.h4 ўe6 52.h5 gh 53.f4 give White saving counter-play. 46...¦с3+ 47.f3 ¦a3 48.¦f4 is not convincing also) 47.h4 ўg7 (47...a6? 48.¦f6 ўg7 49.¦c6 b5 50.a5 b4 51¦b6) 48.¦с8 ўf6 49.a5 ўe5. Sooner or later, the passed b-pawn must decide the outcome. You can find many examples in practice, confirming effectiveness of this virtually typical technical method – transferring the king from one flank to another. In a game especially memorable for me, a rook ending concordant with our theme arose, where playing for win was connected with long alternative king's raids from one side of the board to another. 43...ўg8 44.f3 ¦а8 45.¦а5 ўf7 46.ўf2. As compared to Botvinnik – Fischer, here White is in more favourable situation for defending, as his pawn structure is consolidated and does not require constant presence of the king on the flank. Nevertheless, erecting a dynamical system Black has good practical chances for success. 72...¦e4? The second séance of finishing the game was coming to an end, and being short of time I missed the winning continuation 72...¦g5! 73.¦b1 ¦d5. But, as you know, mistakes goes in flocks. Unexpectedly, my literally ingenious opponent makes an inconceivable return blunder. 73.ўd3?? 73.¦b1! was necessary, bringing the game to a known theoretic drawn position. 73...¦е1. 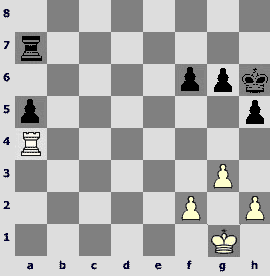 The move was sealed, and White resigned without resuming the game. As a rule, given an extra pawn and provided the stronger side would play accurately, constructing a dynamical system leaves the opponent little hope to escape. I am indulging in seemingly abstract reasoning quite intentionally here, explaining some mechanisms in chess. Indeed, only revealing and describing of a certain systematic commonness in a row of similar positions gives me the right to premise a subheading 'On rook endgame theory' to this work. Otherwise, I would have wasted all my ardour not to discover some theoretic model as a first approximation, but to describe particulars of only one, though famous, of countless examples. I am deeply convinced it is helpful to give room in any chess analysis, besides its substantial core, to similar 'moralizing' most general methodical conclusions. In conclusion, I am very far from thinking that my notes pronounce a definite sentence to the historical position, which has been the subject of our examination. On the contrary, I do not admit the thought at all. The author hopes most of all that this article will serve as a kind of invitation to an investigation, which is in its very beginning, to my mind.